Competitive junior golfers have the opportunity of a lifetime to train with nationally-recognized coaches and stay at a five-star golf resort in Pennsylvania. (PRWEB) February 12th, 2015 – Nike Golf Camps has expanded their junior golf camp network with the addition of Nemacolin Woodlands Resort in Farmington, Pennsylvania. This program is specifically designed for the competitive junior golfer looking to lower their score in a golf-intensive environment. 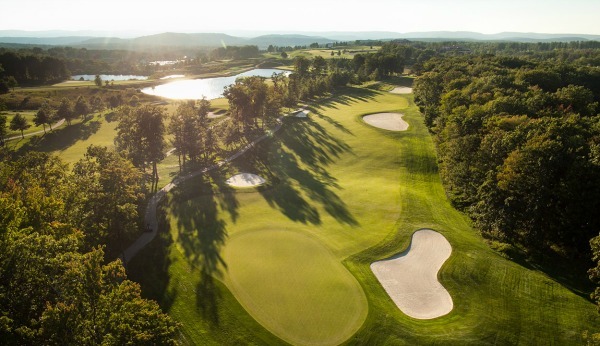 Participants enjoy five-star accommodations at The Lodge at Nemacolin, daily practice and play at the resort’s championships courses (Mystic Rock and The Links), and instruction from Nemacolin Golf Academy Staff members and West Virginia University Head Coach, Sean Covich. The curriculum consists of morning instructional groups with emphasis on short game, putting, full swing, and proper practice routines. A student-to-teacher ratio of 4:1 enables the coaches to work intimately with each camper. Afternoons are dedicated to course play where coaches supervise and provide guidance on shot/club selection, strategy, and mental toughness. On top of group instruction and on-course practice, junior golfers receive 1-on-1 video analysis to work on their swings throughout the week. In the evenings, campers participate in fun, non-golf activities at the resort. Nemacolin Academy Director of Instruction, Brian Rogish, and West Virginia University Head Coach, Sean Covich, co-direct the program. Rogish, a Class A PGA Member, was selected as the 2014 Tri-State PGA Teacher of the Year and also earned “One of the Best Young Teachers in America” through his nomination for the “Top 40 Teachers Under the Age of 40” list. Sean Covich begins his first year at WVU after spending three seasons as assistant coach at Mississippi State University. WVU’s varsity team uses Nemacolin’s practice facility as they train throughout the season. The Nike Golf Camp at Nemacolin has an all-inclusive overnight option, as well as an extended-day camp (9:00AM-8:00PM) for local juniors that wish to sleep at home. Session dates are July 12th – 15th, 2015. The camp is co-ed and is suitable for advanced golfers, ages 12 – 18. Visit Nike Advanced Golf School, Nemacolin Resort for complete information on this camp. Nike Golf Schools & Junior Camps (NGJC) is a division of US Sports Camps, Inc., America’s largest sports camp network. NGJC offers junior overnight and day camps, and advanced player schools at over 100 locations nationwide. Since 1994, more than 170,000 junior golfers have participated in the camps. To explore a variety of camp options and locations please visit the official website for Nike Golf Camps.